If you are not ready for a full facelift and you’re no longer satisfied with the results of topical creams and lotions, Laser 360 is the perfect alternative. Laser 360 is ideal for anyone who would like to revitalize their look without invasive procedures or injections. You no longer have to accept fine lines and wrinkles or skin discoloration as an inevitable part of the aging process. Rejuvenating Intense Pulsed Light treatment delivers visible improvements in facial redness, flushing and Rosacea while helping reverse the signs of sun damage and aging. IPL is absorbed by the target areas, without damaging healthy skin. It requires no downtime and can be used to treat many types of vascular and pigmented lesions quickly and painlessly. Skin resurfacing improves skin texture and tone, smoothes wrinkles and diminishes brown spots. This procedure erases those factors that add years to our appearance, restoring youthful vitality. The laser pulses create tiny ablative zones, removing the epidermis and upper dermis. The treatment then triggers the body’s natural healing process, stimulating the growth of new healthy skin tissue. Pulsed light safely and painlessly tightens loose skin on the face, neck, arms abdomen. Without damaging the skin’s surface, it safely and effectively heats the inner layer (dermis) of the skin inducing the formation of collagen, resulting in a firmer, younger look. Reduce the appearance of fine lines, wrinkles, active acne and acne scars, uneven skin tone, brown spots and sun damaged skin. For maximum results, a series of six or more treatments are recommended, or pair together with a resurfacing chemical peel or Mesotherapy. Reveals smoother and brighter skin. We offer glycolic acid, lactic acid and salicylic acid peels, depending upon your skin’s particular needs. 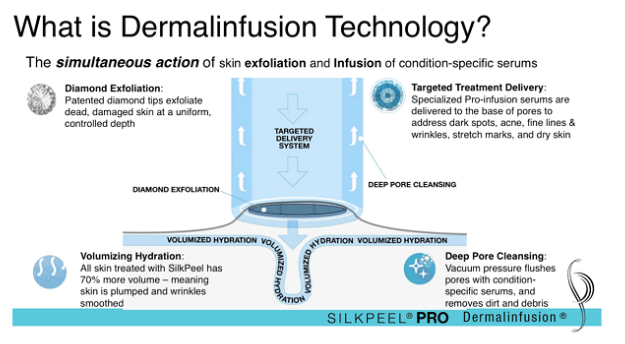 Chemical peels create a controlled exfoliation of several layers of damaged skin cells. The process exposes a fresh layer of skin improving skin tone and texture in addition to removing old, weathered and damaged skin cells. It stimulates the growth of new healthy cells, thereby tightening the skin and minimizing wrinkles.